Cute Cabin 15 miles to Yosemite south entrance. 1.3 miles to Bass Lake. Hi everyone and welcome to our cozy cabin. This fully stocked, charming and beautiful 3 bedroom 3 bath cabin with NEW 2018 HOT TUB located conveniently close to Yosemite National Park, just A short 15 miles from the south entrance. We are just above BASS LAKE 1.3 miles (3 minutes) from the lake shore and the Forks resort where you can dine at the lake side and enjoy the day use picnic areas on the beach. A quick 8 minutes or 5.5 miles gets you to downtown Oakhurst where you will find all the restaurants and shopping that you will need. The property features a brand new 2018 JACUZZI HOT TUB, wrap around deck, gas grill, gas fire pit and 3/4 of deck and porch are covered. Open floor plan for kitchen, dining room, and living room with a 65" TV, DISH TV with all movie, sports, on demand and WIFI in every room. A large wood burning red brick fireplace (fire wood provided) is the focal point for those chilly evenings, and the cabin has CENTRAL AIR conditioning for hot summer nights. The main floor has a master bedroom, with large full bathroom, TV and office area. Sliding glass doors lead to the back deck area with gas fire pit over looking the backyard and trees. The master has an additional doorway that leads to another deck area and downstairs to the back yard. The second bedroom on the main floor also has a Queen bed, 55" TV and is a very good size. It too has sliding glass doors to the back deck. There is an additional full bathroom on this floor next to this bedroom. Downstairs is a private Queen Bedroom, 55" TV, PS4 gaming system with PLAYSTATION NOW on demand with over 600 games available. (Perfect for the kids while you enjoy the main level :) It also has a private half bath, stackable washer and its own private entrance. We provide all linens , towels and soap, shampoo and lotion for your comfort at no additional charge unlike many of the surrounding cabins that charge a linen fee. We are committed to doing everything we can to make your stay with us. New Jacuzzi HOT TUB added in 2018. Hello. We are Sara and Tony Bruno. We purchased this property in October 2017 because we fell i love with the location and the cabin itself. The cabin is very convieint to Yosemite National Park and 3 minutes to Bass Lake for all the recreation you would want to enjoy. This Cabin is adorable from the moment you walk in the front door. We take pride in keeping our cabin very clean and by not allowing pets or smoking. We offer a Keurig coffee maker with complimentary K cups. Its location is in a quiet community and close to the park and the lake. Master bedroom has its own full bath. With double sinks and mirrors, and separate shower and tub space. Bass Lake Heights is a community of cabins nestled around Pine, Cedar and Oak Trees. All bed linens, comforters and quilts are provided with the rental. A beautriful red brick wood burning fireplace is a focal point of the living room. All wood is provided. Turkish Spa Towels are provided. Keurig Coffee Maker with K cups featuring coffee, tea and hot chocolate, and a traditional coffee pot as well. Foil, baggies, salt and pepper, paper towels. All dishes, silverware, glasses, mugs, Pyrex, pots and pans are included. The dinning room sit 8 people comfortably. Dish TV Movies, sports and on demand channels included. This cabin is just a mile away from Bass lake and at a driveable distance from Yosemite valley. Had all the amenities that you need on a holiday. Our stay in this cabin was enjoyable. Would definitely choose this again if possible. Most of our phones were not reachable for calls but we had Wifi and we could use internet to make calls. Sarah and Tony were wonderful. They sent a detailed email on the day of checkin with all required information and also called us to answer any questions. This was an amazing house at such a great value. Very clean and everything we needed. Loved the small touches. Great thought went into this house. The cabin was immaculate and so cozy. It made us feel at home we didn’t want to leave. I want to start off by saying thank you to Sara and Tony!! We especially want to thank Tony for all the help and the great conversation we’ve had with you. The cabin was so immaculate and clean. 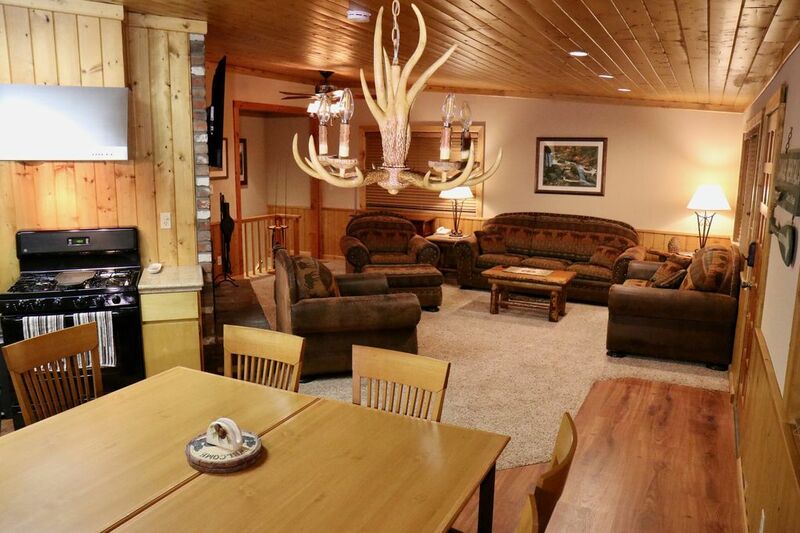 The decor in the cabin is top notch and the wood work is phenomenal. We really enjoyed the spa it felt so good and Saturday night as we sitting in the spa it bagsn to snow. That was so awesome! Thank you Sara and Tony for having such a wonderful property to rent out. We will definitely come back again anytime of the year to enjoy the peace and serenity of the mountains and away from the city. The bedrooms are spaceous the beds are comfortable. It is nice having sliding door that go out to the wrap around deck. The living room with the fireplace is so comfortable to sit and enjoy the fire crackling in the fireplace. The kitchen is nice and roomy as to accommodate several people at one time. We really enjoyed sitting at table and having our meals. Over all we just want to say that this was one of the greatest times we’ve had together. The location of the cabin in proximity to Yosemite is ideal. We drove to Yosemite on Saturday and spent the day and that was enjoyed greatly. We can’t wait to bring the rest of our family to the cabin another time. Looking forward to that and already planning. I would highly recommend this cabin to anyone looking for a quiet getaway for a weekend or longer. I would recommend longer if a person can. Easy to make reservations and Sara and Tony are helpful in meeting needs and making your stay enjoyable and hassle free. This couple are the most friendliest and make you feel like you’ve known them for a long time. Our family had a very nice relaxing weekend in Oakhurst. This house is very well taken care of and the owners strive for their guests to have a happy experience. I enjoyed the fact that the home is in a neighborhood. We took several family walks. Plan to stay here again. We had a great time at this cabin. The entire house was very warm, comfortable and inviting. We really enjoyed the hot tub and the large wrap around deck. Enjoyed cold mornings on the deck with hot coffee and a blanket. Would love to come back in Summer too! Thanks for having us! Owners were awesome and texted and called anytime we needed them! Great cabin and felt like home. Highly recommended! This cabin was clean, well taken care of and felt like home away from home. We wouldn’t hesitate to stay there again.